The Carambolo Treasure is an assemblage of gold items of the first millennium BCE, whose origin has for about 50 years been the epicentre of a heated debate. New chemical and isotopic analyses, carried out by the UPV/EHU’s Geochronology and Isotopic Geochemistry Service – Ibercron and commissioned by the University of Huelva and the Archaeological Museum of Seville, suggest that the source of the gold is not thousands of kilometres away from where the treasure was discovered but a deposit located only 2 km from the spot. 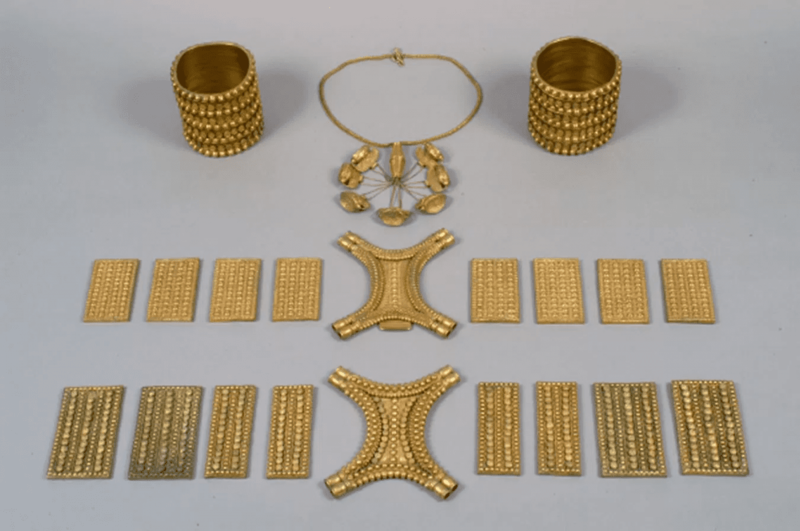 The high value in museum terms of this collection of gold items drastically limits the possibility of using classical techniques to analyse dissolved samples, so as a complementary means they used “a kind of laser ablation that makes a minute hole of only 100 micra or 0.1 mm”, explained Dr Sonia García de Madinabeitia, one of the people in charge of carrying out the analyses. This service has one of the few laboratories existing internationally that does analyses of lead isotopes for archaeological studies. The laboratory combines a system of laser ablation with plasma mass spectrometry “with which we not only do isotope analyses but also elemental analyses directly on solid samples with the minimum possible impact”. The UPV/EHU researchers determine isotope ratios in archaeological objects as well as in the materials linked to the manufacture of these objects and on the materials potentially used to make them in order to find out where the raw materials came from. As García de Madinabeitia explained, “we are compiling a database of the different ancient mineral deposits so that the relationship existing between the archaeological remains and the possible mine they came from can be established”. “We base ourselves on a kind of footprint of the lead,” explained the researcher. The isotope ratios of lead vary in terms of the function of the materials used and the age of the materials, and we determine the isotope ratio that the lead has. The fact is that there are considerable differences between some mineral deposits and others”. Apart from that, the researchers at the laboratory conduct elemental analyses, in other words, they quantify the trace and ultratrace elements in the materials, “because we know that mines, however much they may be gold or silver mines, never consist of pure materials, but have a series of trace and ultratrace elements that subsequently allow links between the archaeological materials and the geological materials to be established,” added García de Madinabeitia. Through the numerous studies conducted by the UPV/EHU’s research team, some hugely interesting facts for getting to know antiquity have come to light. They include the local supply and trade in metals in the south of the Iberian Peninsula long before the arrival of the first peoples from the Eastern Mediterranean; the recycling of gold by the cultures of the lower Guadalquivir river area since 3,000 BCE; or the use during the Bronze Age of raw materials that came from locations thousands of kilometres away. Header Image: Image of the gold items in the Carambolo treasure. CREDIT (© Consejería de Cultura de la Junta de Andalucía / J. Morón).